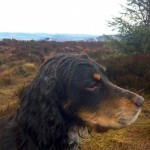 If you think Benaquhallie is boggy and horrid, take this route. Go left immediately after the gate (it looks like an impenetrable bank of gorse, but there are ways through) and follow the fence line all the way round to the top. No bog, a decent path and lots of flowers in the meadows on your left. Lovely, at least on a sunny day. You could probably do it by bike as well. This entry was posted in cp89 and tagged DaveH on August 7, 2015 by site_admin. I left the car beside the old quarry east of Evelyn and Derek’s. 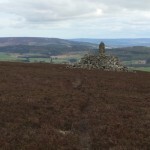 The track goes past an old steading, then you head uphill until you reach the drystane dyke, then follow it up to the summit, which has a trig point, Further over, there is a strange cairn structure. I saw yellowhammer, skylark, wheatear, song thrush, blackbird, meadow pipit, pied wagtail, cuckoo, reed bunting, red grouse, common gull, black-headed gull, curlew, rook and crow. This entry was posted in cp89 and tagged Phil on June 18, 2015 by site_admin. Started from Milton of Tolmauds, with lots of new lambs around the farmyard. 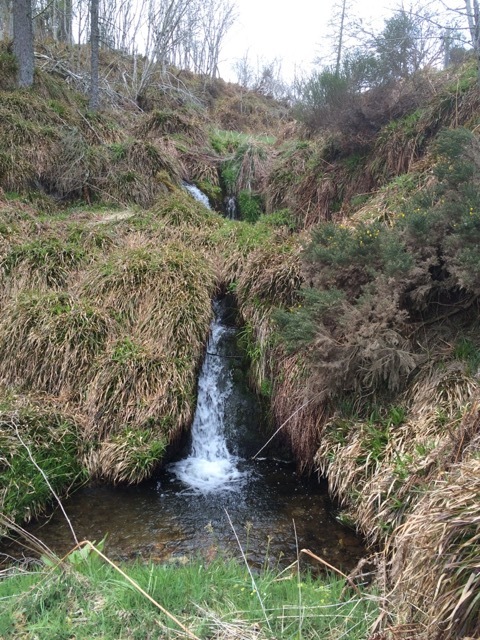 Up via Graigenhigh to Fork of Midmar, where there is a nice wee waterfall tucked away – looks a haven for wildlife. Then up past the site of a Stone Circle, not obvious amongst a lot of rock outcrop. 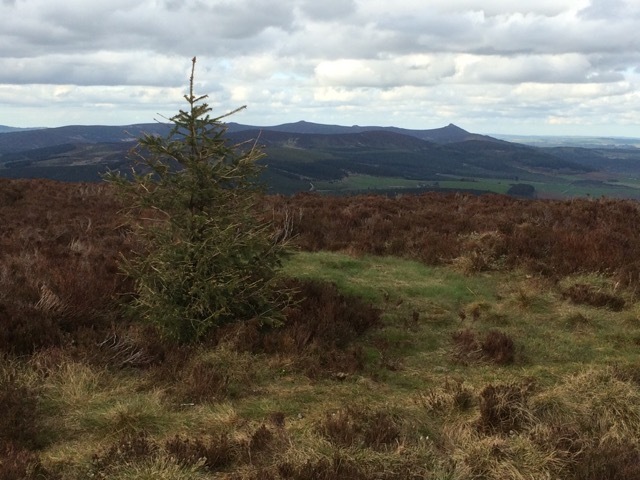 Followed tracks around east side of Forkins Wood up to fence line, then up through deep heather to Green Hill, with the lone tree at the top. Little used vehicle track at the top – so looks like access from the north and east sides of Green Hill would be better for running. Then back down through the heather to Forkins Wood, finding newly built access roadway (for wind turbines?) which terminated before getting out to the Corrennie Moor side. 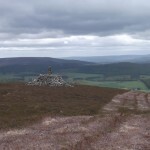 Took vague track up fence line to Red Hill, then followed fence line across Corrennie Moor to Benaquhallie. Mown heather tracks on rise up to Benquhallie made the going much quicker. Returning down off the hill via Newbigging. This entry was posted in cp89, cp90 and tagged Warren on May 3, 2015 by site_admin. What a change! 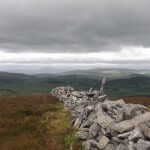 Last weekend was wet and very miserable and this summit was bipassed on route to the Coyles. Today was heaven, clear skies, snow on the tracks and a pleasure to cycle. 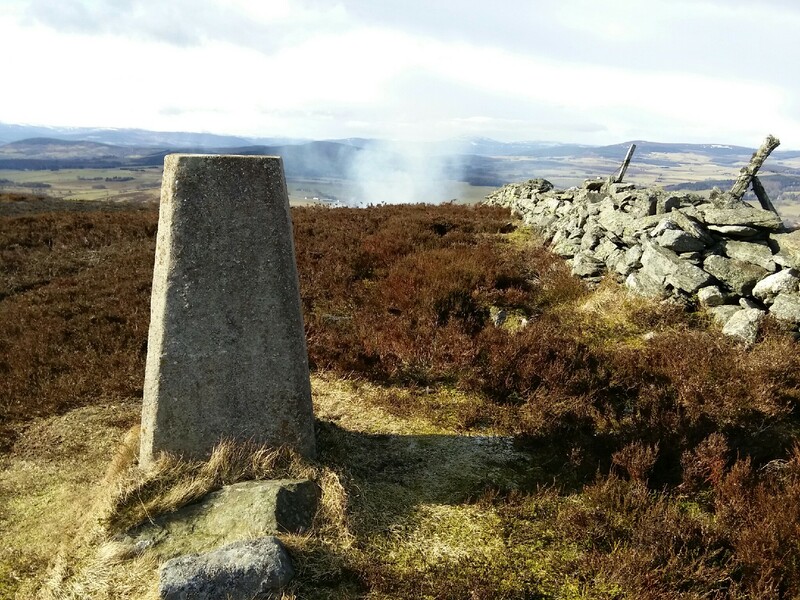 It was blowing a hooley and of course there are two summits. Really enjoyed the Linn of Muick this time, particularly the Salmon Ladder. 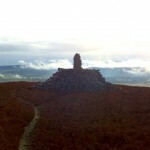 Benaquhallie was a combination of need to walk dogs, shop in Banchory and obsession with trig points. Though must say best thing was the name. This entry was posted in cp 43, cp89 and tagged Duncan on March 3, 2015 by site_admin. This entry was posted in cp89 and tagged JaneO on March 3, 2015 by site_admin. This is just out our back door and we were already up there in January but today we’re going to press on and do an out and back to 90 Green Hill. We live just a half mile east of the access from the B9119. You are welcome to park at Rowanbank if using this route and you might even get coffee and a biccie on your return if you catch us in. Take the sheep track across the field towards Clasholm and then we follow the land-rover track around the edge and up alongside the drystane wall to the top. The purists among you might well try going straight up from Clasholm but it’s quite wet in the hollow. On the way up we had several flypasts from the RAF, both fighters and transports. Usually they use our house as a landmark and they are quite impressive thundering overhead (maybe not to everyone’s taste though). At the top we found a man sat with his back to the trig with a ham radio setup. 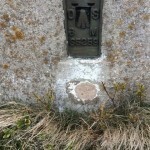 His hobby seems to be to visit trigs, setup his mast and then see who he can contact from each one. Today he had already spoken to stations in Germany and Holland and was about to try for the USA. This entry was posted in cp89 and tagged D&E on February 20, 2015 by site_admin. Starting from the west end of the Tolmauds road, headed up the track to Green Hill. 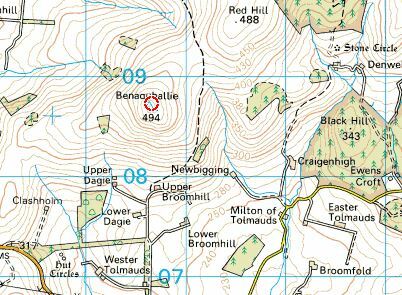 From there a bit rough through knee deep heather and then a deforrested quagmire, but once past the boundary fence was able to follow land rover tracks over Red Hill and on to the top of Benaquhallie. Returned by another land rover track traversing the south side of Red Hill, down through some fields and onto a farm track that takes you back to the road about 1km from the start point. This entry was posted in cp89, cp90 and tagged KatieH on February 16, 2015 by site_admin.